1. Macbeth was a real king of Scotland. 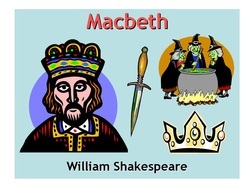 How did the actual Macbeth compare with Shakespeare’s fictionalised version? Well, the real Macbeth was a comparatively successful ruler (kings tended not to reign for long periods, as they were inevitably betrayed by ambitious men close to them). From what we know, although the real Macbeth did usurp his predecessor Duncan, he was not a tyrant. So, why would Shakespeare twist history? Well, partly, because he knew that a play about a man who killed a king and then successfully ruled would probably not appeal to the recently crowned James, especially given contemporary events (more on that later). Therefore, he had to ensure that Macbeth became a monster and, more importantly, that he was punished for usurping the rightly appointed king. 2. The witches were almost certainly included to please King James. James, who had been the king of Scotland before ascending the English throne, had something of an obsession with witches. He instigated a mass witch hunt in Scotland, and even wrote a book on the subject of witches and witchcraft entitled ‘Daemonologie’. This fascination seemed to stem from a paranoia about witches, several of whom he believed had instigated an assassination attempt. 3. The witches prediction that Banquo will ‘get’ kings is both historically accurate and is another unashamed nod to James, because James is, in fact, a descendant of Banquo. 4. The play was written in the period just before, during and following The Gunpowder Plot. In November, 1605, Robert Catesby and a group of fellow disgruntled English Catholics (Catholicism had been outlawed under the reign of Elizabeth I and continued to be so under Protestant King James) planned to blow up the House of Lords, along with James himself inside. The plan was foiled and those involved were tortured and murdered. However, it sent shockwaves through the court and London. And it unquestionably influenced Shakespeare when writing Macbeth. Not only was the play a great piece of entertainment, but Macbeth’s bloody end also served as a warning to any one else who may have been pondering an attack on the king’s life. 5. It is rumoured that the boy playing Lady Macbeth (no women were allowed to act during this period, so all female characters were played by young men) died shortly before the first performance. It is reckoned that, unable to find anyone to fill the part on such short notice, Shakespeare leapt into the deceased actor’s shoes. - Fate or self determination? - What does it mean to be a "man"?